Since an earthquake and strong aftershock hit Nepal April and May of 2015, there have been significant relief efforts to help with the reconstruction. Most of the relief work has been done by Christian relief organizations and the people of Nepal have seen the love of Christ displayed. April 25, 2015 started as any Saturday in Nepal. Christians usually meet in churches on Saturdays. They were meeting in their church when all the sudden, they felt a quake. Little did they know that over 8,000 people would die from the magnitude 7.8 earthquake . The nation was shocked by the devastation and death the earthquake brought. Immediately, the people of Nepal mobilized to help their countrymen in the midst of strife. Within two days, Christians inside of Nepal not only helped the rebuilding efforts, but also counseled those who were grieving. According to Gospel for Asia, “Gospel for Asia-supported Compassion Services teams promptly began offering aid and ministering to survivors.”  They provided food and a listening ear to those who were hurting. Gospel for Asia was not the only ministry to promptly respond to the needs of the field. Christian Aid, another Indigenous missionary organization, was also there from day one. According to Christian Aid, “With rains and landslides cutting off road access to many areas, local Christian workers know how to get aid to people deprived of their homes and to come alongside the shell-shocked survivors in their trauma, she said.” The monsoon season came with the earthquake, making it harder to provide proper aid to the people. Christians continued to share Christ’s love through rebuilding efforts. Gospel for Asia started to provide classes so people could generate an income for themselves. According to Gospel for Asia, “‘After the earthquake,’ Deepit said, ‘many people are in need of basic needs: food, shelter and clothes. They are in financial crisis. [This seminar] is one of the small attempts of [the church] to make them financially self-reliant.’” People needed to be retrained to be self-sufficient because many of their sources of income were destroyed in the earthquake. Mission Nepal continued to provide practical relief to the people. Yet, it was not the material relief that the people of Nepal needed, but “One of the Pastors that I visited in whose Church 23 had dead, we don’t need food or blanket, we wish that someone come here and say we come to meet you and pray for you.”  Months after the relief efforts started, people still needed moral support. Pastor Lal has his ministry in Nepal with Children’s Hunger Fund. He works in a remote village. In this village, he shares Christ’s love. After the Nepal earthquake last April, Pastor Lal wanted to do something to share Christ’s love with the people. Pastor Lal was provided with tin sheets to put on the top of houses. According to Children’s Hunger Fund, “Ranjita’s family and many others in the village are very grateful for Pastor Lal’s assistance, especially since no one else had helped their remotely located village.”  Pastor Lal’s wish is to build a church building and school for children. 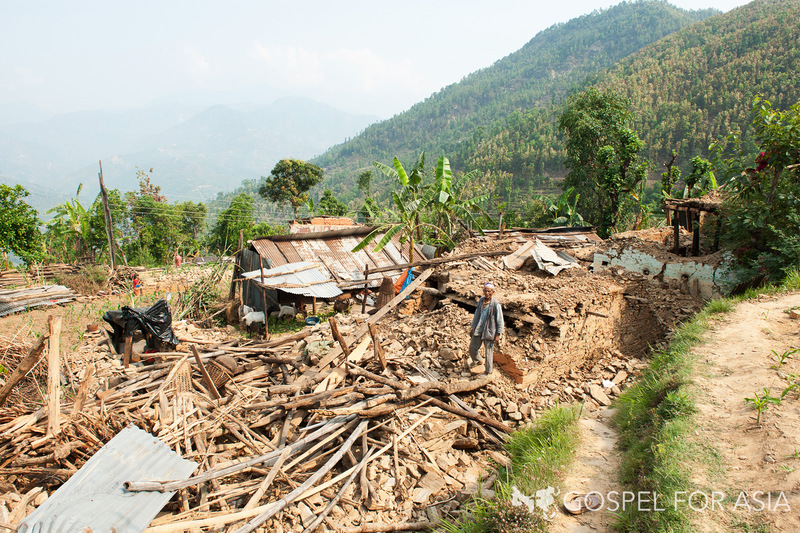 Baptist Mid-Missions works in Nepal to rebuild disaster areas. They rebuilt a church and put a tin roof on it. Extremists put holes in the roof though, much to the dismay of the Christians. Not only do they rebuild churches, but they also provide relief such as food and shelter. According to Baptist Mid-Missions, “In the past 10 months, World Relief has forwarded funds to help the Ebenezer Fellowship distribute food, clothing, and temporary shelter.”  Not only do Christians seek to provide counseling to those who are hurting, but also to provide for the physical needs of the people. Not only do Christians provide handouts, but they also train others to be productive. According to United Mission to Nepal, “Part of UMN’s Dhading Disaster Response is to provide such training to 500 masons.”  They are currently training 125 students so that in the case of future disasters in Nepal, they will be able to help with the relief efforts. 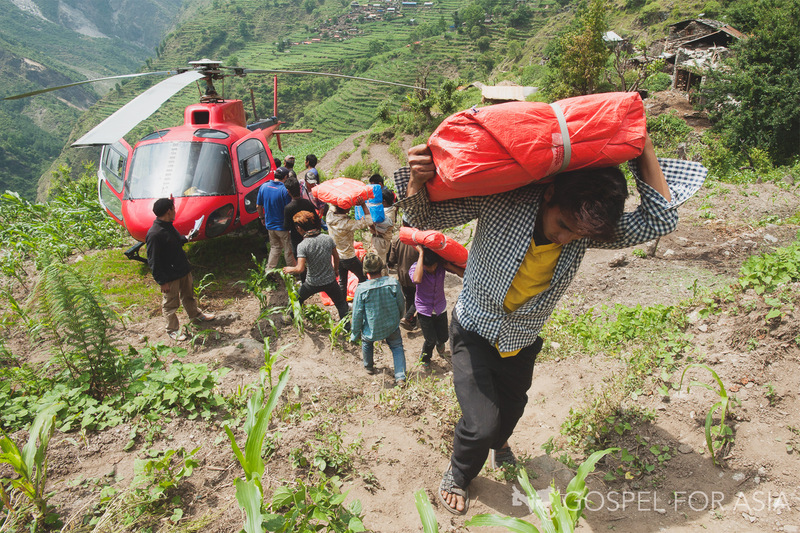 Ever since the Earthquake hit last April, Christians have provided relief to the people of Nepal. Not only have they provided with food and rebuilding, but they have also provided counseling to those who are grieving. A year later, Nepal still lays in ruins and there is still a lot of work to do in the relief efforts. According to James Nachtwey of Time Magazine, “Yet, nearly from the 7.8 and 7.3 magnitude ruptures, there is little sign of any rebuilding.”  We need to continue to keep Nepal in our prayers, because it will take years to fully rebuild. This entry was posted in Essays and tagged Childrens Hunger Fund, Christian Aid, disaster relief, Earthquake, Gospel for Asia, Nepal, News. Bookmark the permalink.